If you want to engage in the relaxing activity of birdwatching, you don’t have to bother yourself with traveling around and lugging birdwatching gear with you. Instead, if you own a medium-sized backyard, you can attract birds to come to you, and not just any birds. Colorful and pleasing to the eye, bluebirds are native to the North American continent, but they came close to being endangered thanks to reckless introduction of two invasive bird species – the Starling and House Sparrow. These non-native birds have decimated natural nesting grounds for bluebirds, along with the increased use of pesticides. However, due to systematic efforts beginning in 1930s by Thomas Musselman, bluebird populations have largely recovered. Nonetheless, the recovery of bluebirds is still an ongoing effort in which you can play an important part by attracting them to your backyard, thus ensuring their continued survival. Bluebirds are largely carnivorous as they like to eat protein-packed insects the most. However, during the harsh weather conditions and lower temperatures they will accept ripe fruits, sunflower bits, suet, cornmeal muffins, wild berries, and other food you can usually find for bird feeders. Mealworms are the most nutritious supplemental form of food for bluebirds – filled with many vitamins, minerals, and other nutrients. 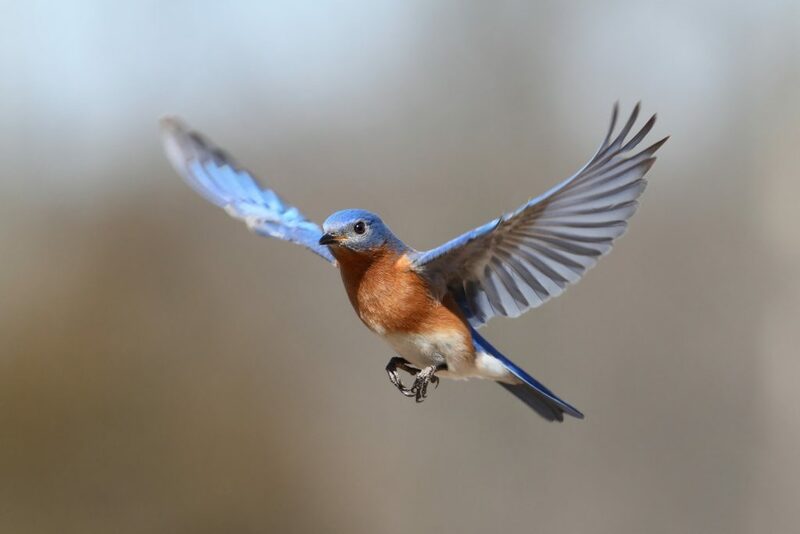 Bluebirds are instinctually attracted to mealworms, as they offer the most nutrition per meal weight, which translates to less energy expenditures. Mealworms are sterile, meaning they do not carry parasites and human-related diseases. Mealworms offer easy maintenance as a regular food source. Mealworms can habituate bluebirds to use the nestboxes you have placed, as well as being a huge dietary help when bluebirds have offspring. With that being said, mealworms still count as a supplemental food, so if used as main food source it could cause calcium depletion, which would have severe consequences – egg binding and weak bones in young birds. To avoid that from happening, you should coat mealworms with calcium carbonate or calcium citrate powder, just before you offer them to bluebirds. You can easily obtain both forms of powder from many online stores. As for the frequency of feeding, it depends on the weather conditions. On normal weather, once per day would be enough, while a pair of nestling bluebirds with offspring would require up to hundred mealworms per day. Although they have “worm” in their name, mealworms are actually not related to worms in the slightest. They are simply a larval form of the darkling beetle – Tenebrio molitor – one of those beetles that have wings but have no flight capability. That should be the core of mealworm nutrition supply, but it is also important to enhance the food with moisture once a week by adding a piece of ripe banana peel, potato, carrot, or apple. However, in order to avoid creating mold, make sure to place the moist food on a piece of cardboard or paper towel to soak the excess moisture. Mold will kill mealworms, so change the padding regularly. Any ventilated (perforated) container will do. The same requirements for butterfly larva would apply for mealworms as well. Usually, this comes in the form of a plastic box with a perforated top for proper air circulation, while the size of the box depends on how much space you can spare. Darkling beetle has ‘dark’ in its name, which should clue you in on the fact that its larval form prefers dark spaces as well. The temperature should be neither cold nor hot, but should not be over 77°F (25°C) as that would trigger them to undergo rapid development. Since you are not trying to grow the adult beetles but just nutritious mealworms, you can safely refrigerate them for several months when you see that they are sufficiently bulked up. The low temperature will trigger a dormant state, so you can evenly distribute them to bluebirds all year long. When you refrigerate them be sure to remove all the vegetable and waste matter. And lastly, if you are not into growing mealworms, you may try out commercial dried ones, but be aware that bluebirds are attracted to live, wiggling mealworms, not lifeless ones. Still, if there is nothing else around, they may go for them as well. To entice them, you could add some water or vegetable oil to spruce them up so they appear like they have died recently. Getting mealworms to bluebirds is the trickiest part of the whole operation because other birds will want a piece of that tasty morsel as well. The last thing you would want to do is help the invasive bird species even more! This is why selecting the right type of bird feeder is crucial. Don’t try to just place the mealworms on the ground in the hopes that bluebirds will hone in one them. More likely scenario is that mealworms will just burrow into the ground, while robins and other non-bluebirds will just pick them clean, leaving nothing for the bluebirds. Instead, get a hopper or a cage-type feeder where you can place the mealworms inside the feeder. To preclude larger birds from entering, it should have 1½ inch or 1⁹⁄₁₆ holes on each end. Bluebirds are curious by nature, so they will soon explore the feeder and find the mealworms, as well as making themselves a new home if you supply them with mealworms on a regular basis. Smaller birds may also avail themselves with the feeder, but if bluebirds get there first they will defend their new home vigorously, especially if they are already set for nesting with a partner. In addition to choosing the right feeder, make certain that mealworms can’t wiggle out and fall to the ground. To that end, place them on a shallow plate that has rims, but that are not too sharp.